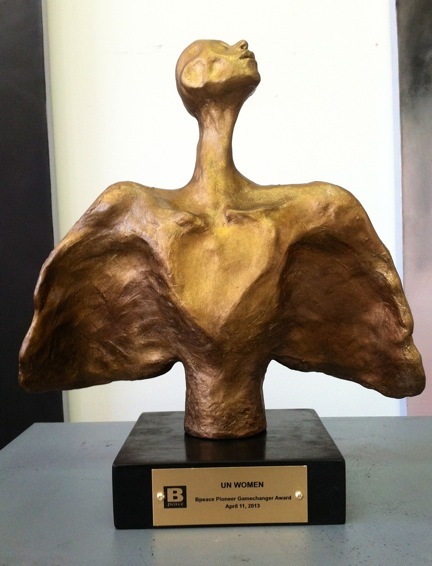 An original work of art--the Bpeace Pioneer Gamechanger Award created by sculptor Anne Kellett. We wanted something very special to present to our Bpeace Pioneer Gamechangers at our Gala celebrating Bpeace's 10th Anniversary. An ordinary trophy or a certificate, just wouldn't do. Ever the marketer, I envisioned something that would stand out in the offices of our winners, and would compel visitors to ask them, "What's that?" Keeping it all in the family, I reached out to former Bpeacer Anne Kellett, who was active in the early days of Bpeace, and now is a full-time artist. Anne jumped at the chance to have her work grace the offices of UN Women, the U.S. State Department and dressbarn. The result is a bold figure, with a 12-inch wingspan, weighing at least five pounds. Anne described her intent: "The most important aspects of the award is the heart, representing the first thing that must be open in order to help; the wings, representing a dove's wings for peace as well as spread open for protection; and finally the head representing looking to the future as well building one by sharing intellect." 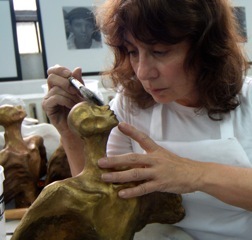 Anne applying the bronze patina.Anne first sculpted the awards in clay. Then a rubber mold was made and the sculptures were cast in hydrocal and given a bronze patina. The result is stunning! Anne is keeping the mold for us, and has one extra award in storage. Who can we honor in 2014? 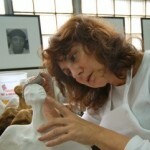 Here is more info about Anne's work.